The Sporting Life is invigorating. The Sporting Life is fun. The Sporting Life is satisfying. Its ski, its après ski and everything in between. Its beach time with the kids, its spin class at the club. From learning the news swing, to getting back on the old bike. Its hiking the trails of Algonquin and lounging on a boat in the Andaman Sea. The Sporting Life is the good life. And our customers are living it. We are a place where customers can find the best quality brand name fashions and sports equipment that supports the active and energetic lifestyle they live and love. Sporting Life opened 34 years ago with the belief that we could supply quality products and brands that enhance our customers active lifestyle. We have experienced consistence growth over the years due to innovation and excellent customer service, becoming a respected brand known for the top- of- the – line sports equipment and fashion. We have 3 locations situated in the Toronto Area and one location in Collingwood. 2665 Yonge Street – Our Flag ship store. This is in the heart of uptown Toronto. We have over 36 000 square feet of selling space across two floors. 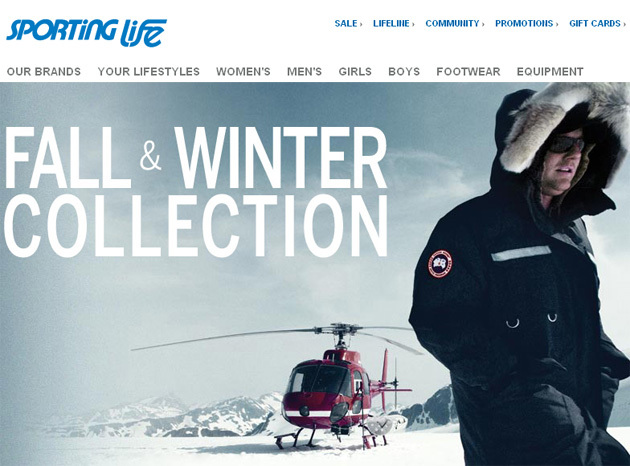 2545 Yonge Street – Our Bike and Snowboard Dedicated Store with over 10000 feet of selling space. Sherway Gardens Location – Located in one of Toronto most prestigious malls, this location has 42 000 square feet across two floors of selling space. 7Collingwood Location- Situated in the heart of ski country, our Collingwood location has 10 000 square feet of selling space. New Sporting Life Location in Canada’s Capital. We are very excited to make Ottawa our first stop in a cross country expansion. We will be opening a 43000 square foot store in the heart of the newly rebuilt Lansdowne park in the fall of 2014.